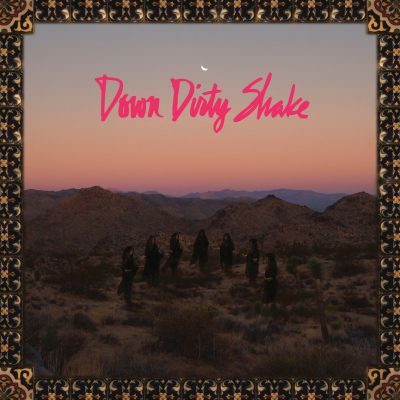 Based in San Francisco, Down Dirty Shake seamlessly blends the sounds of Latin, psych, soul, pop, and garage rock. The group was founded by AJ Ayez (vocals, keys), Kyle DeMartini (guitar, vocals), and Aaron Grimes (drums, vocals) while the three were high school classmates in Merced, CA, and in the ensuing years the band’s style and vision have matured. While staying true to the love of Sixties blues and psychedelia that initially drew them together, they began incorporating influences from Motown, world music, Krautrock, and more. After moving west from Merced, the band firmly entrenched itself in the Bay Area music scene by hosting a yearly residency in the iconic Haight-Ashbury district and playing prestigious venues and festivals in both San Francisco and throughout Sonoma County. The addition of Tommy Anderson on bass completed the line-up, and now the band presents its debut full-length. The self-titled album could be described as Santana performing with The Doors in a Desert Rock fever dream. Dynamic percussion, ripping guitars, complex bass lines, dreamy pedal work, poetic lyrics, and Ayez’ sultry vocals combine to give the listener a feeling of something nostalgic and familiar yet unique and original. The record also features guest performances by Sonny Pearce (percussion) and Celeste Obomsawin (vocals).